OPPO has announced that is now accepting pre-orders for its flagship smartphone Find X. Launched at the Louvre Museum in Paris last June 19, the Find X disrupted the smartphone industry with its breakthrough design and full array of innovative technologies that highlight the company’s constant pursuit and exploration of the future smartphone. We are happy to finally open up our most innovative smartphone to date for pre-orders to the Philippine market... Through the years, OPPO has introduced some of the most future-forward concepts to the tech world. With thorough product development, these concepts have materialized in the state-of-the-art Find X, which is tailored to level up the most digitally-savvy lifestyle. OPPO PH offers its flagship Find X in two stylish colors: Glacier Blue and Bordeaux Red. 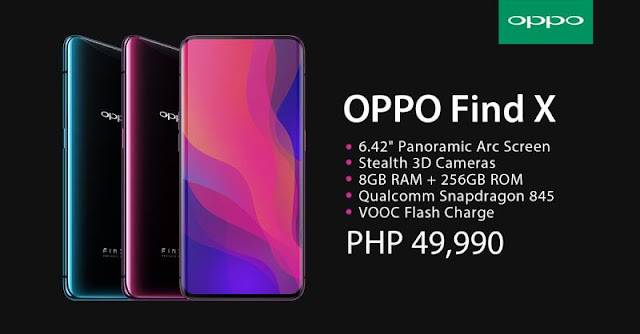 For more information, visit www.oppo.com/en/smartphone-find_x or follow OPPO Philippines’ official Facebook page at www.facebook.com/OPPOPH to be updated of the latest promotions and news about OPPO.